ACTING SUSTAINABLY IS SECOND NATURE TO US. If, like us, you have been transforming natural raw materials into long-lasting, timelessly beautiful products for over 100 years, sustainability is firmly and inextricably enshrined in your DNA. Simply consider that our enamelled steel is the most future-proof material for bathroom products given that it can be 100 % recycled and itself contains 20 % recycled steel. Naturally, we take an equally consistent approach to conserving resources for production and transport. In 2017 KALDEWEI received a Green Good Design Award for ecologically outstanding products. There’s also our 30-year warranty which sets the products made from our material apart from plastic alternatives, and makes them the ideal choice for eco-friendly, climate-neutral building. In fact, sustainability even pays off as an element of green building certification such as LEED. Nor should we forget the lasting value provided by the long lifecycle. KALDEWEI uses only natural raw materials for its steel enamel products. That applies to both the steel and the enamel which is made from natural substances such as quartz, feldspar and minerals. Our bathroom objects are fully recyclable. KALDEWEI is the only bathroom manufacturer to make its own enamel, which means it controls the entire value chain from creation to application of this surface refinement. Eco-friendly manufacturing processes that are gentle on resources are second nature to KALDEWEI. Packaging and transport are reduced to a minimum. Concentrating production at our factory in Ahlen allows us to use integrated manufacturing processes and optimised logistics. KALDEWEI pays great attention to energy efficiency, to which end it operates a modern block heating power plant. Wastewater goes to our own water treatment plant. KALDEWEI is a member of the German Sustainable Building Council (DGNB) which takes a useful life of 50 years as the basis for its building certification. Based on the DGNB’s innovative lifecycle analysis, KALDEWEI products score high, not least because of their 30-year warranty. 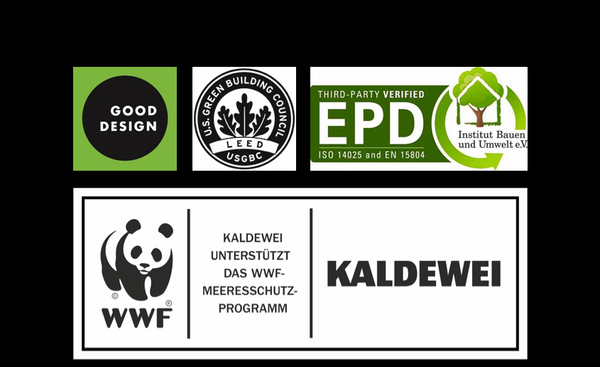 At international level, KALDEWEI is a member of the U.S. Green Building Council which developed the widely recognised LEED Standard (Leadership in Energy and Environmental Design) for eco-friendly and climate-neutral building. This quality checkmark that is being demanded by more and more investors and builders counts Environmental Production Declarations such as those presented by KALDEWEI as a component of green building certification. KALDEWEI is further a member of the Singapore Green Building Council. As a member of the Institut Bauen und Umwelt e.V. (IBU) we support its aims and the promotion of sustainable building in particular. In this area the IBU runs a Type III Environmental Declaration Programme based on the ISO 14025 and EN 15804 standards. By producing Environmental Product Declarations (EPDs) and publishing them in the IBU’s Declaration Programme, we disclose all relevant ecological information about our products. ACTING SUSTAINABLY – WITH THE WWF. As a family business, we also think beyond the immediate impact of our activities – about future generations and the kind of environment we will bequeath to them. That is why we are getting involved in preserving the ocean habitats that connect us all and which are threatened by the rapidly swelling tide of plastic waste. As a partner of the WWF we are supporting a model project that aims to sustainably and effectively reduce the amount of plastic waste reaching the ocean – by making plastic too valuable to simply throw it away. For KALDEWEI that’s another, smart step towards a more sustainable future. THE WWF AND KALDEWEI ARE ESTABLISHING WASTE SEPARATION IN THE MEKONG DELTA TO PREVENT 2,300 TONS OF PLASTIC WASTE REACHING THE OCEAN EVERY YEAR. Plastic enters the ocean via rivers, particularly the Mekong because in Vietnam most waste is still disposed of in the countryside. When the Mekong breaks its banks during the rainy season, it sweeps tons of plastic waste along with it into the Pacific. The Long An model project aims to lastingly prevent that. Turning waste into opportunities.